The lynchpin in the anthropogenic global warming theory is the shrinking Arctic ice, but now that some of that ice is actually increasing, scientists claim, without a trace of irony, it is normal for temperatures and ice sheets to fluctuate. If it's up to meteorologists from Denmark's Meteorological Institute, there is not anything inherently contradictory that extreme cold is replaced by higher temperatures than average. Or that melting sea ice occasionally is replaced by expanding ice sheets. 'Weather is a phenomenon which changes from year to year and right now the atmosphere has changed so we have cold weather. That will certainly mean that melting ice in the North Pole will be less this year, but next year the situation can look completely different,' according to [no first name given] Henriksen. To sum things up, global warming hasn't been called off. In the meanwhile, western Greenlanders will have to accept that the cold weather continues for some time. At least until next Tuesday when milder weather could be on the way, according to Polarfronten online. Well, isn't that what some “skeptics” have been saying about the recent temperature spikes? That climate changes over time, and it has been warming since the Little Ice Age? 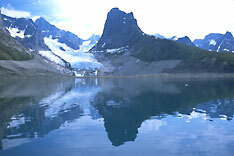 If all the inland ice on Greenland was lost, the oceans would rise about seven metres. Antarctica contains about ten times as much ice. **Update 22:00--As far as I can tell, no one in the major media reported this.